Looks like a nice board to run as MySensors Ethernet gateway, maybe with the minimal version of MQTT for mysensors @Damme is trying to implement. What kind of Ethernet chip does it have? @gregl YES, please do explain it. I'm up to my eyeballs with the Serial Gateway so I want to start working on an Ethernet Gateway and if this can be adapted easily then there is no sense go all in for a single unit gateway of my own. Probably just blind, I at least can't find it! But what type of Ethernet controller does it use? It says "Wiznet", and that it's compatible with the Arduino ethernet library. So it's one of the wiznet chips. The other Wiznet candidates would be the W5200 and the new W5500. As mentioned this is a really cheap all in one WizNet based Ethernet board. What makes it ideal for MySensors use is that it also includes a header for NRF24 radio..although an easy hardware modification is needed so we can use the sketches and libraries direct from Hek largely unmodified. So you have two options...Either make the hardware mods described below or make the changes to the RF24 libraries. I chose the HW changes largely as i didnt fancy changing the library and mySensors has made some improvements to this library and I would need to modify them each time this is updated...not so interested in doing this! You need to cut the existing traces from the atmega going to the RF24 header ( D5,D6,D7) and then solder three short wires from the ISP header to the RF24 header. We're lucky.. the ISP header is located right next to the RF24 header and this has the three pins we need to feed the radio. Again some more luck. The three pins are together and on a corner of the Atmega so use a sharp Exacto knife of similar and cut these three traces. If your nervous then use your multimeter to check you have the correct pins. Once cut, verify using your multimeter that they are now isolated nor shorted to GND. I dont use Include button or LED's so if you do want to , then post back with your solution. Set the IP and MAC as you need to. I have multiple ethernet arduinos on my LAN so i always change from the default DEADBEEFFEED to something else...just change a few of the existing HEX. Set Arduino IDE to "Duemilanove" - and upload away!! You should be able to ping the IP address, and if your radio is working you will see any messages from your mySensors sensors in the serial console. I'm using a NRF24l01+PA+LNA which have higher power requiremnts than the non ampified radios. - working great! I didnt need a decoupling capacitor either. Presumablhy they moved to software SPI on GPIO pins because the WizNet chip is on the hardware SPI. 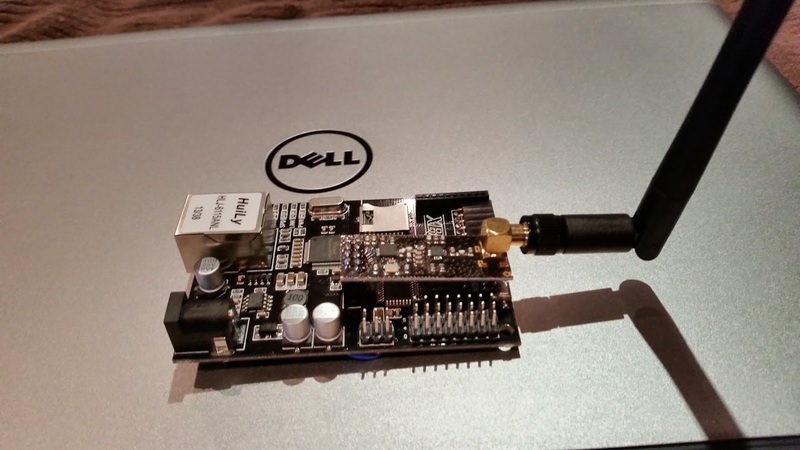 It sounds like you've had no trouble sharing SPI between the radio and ethernet tho. IIRC, there may be some fun and games trying to share spi with ethernet and SDcard slot at the same time...but never played with the SDcard on either boards.. If devices use different modes, be sure to set the mode and speed when accessing a device rather than assuming it's still the same. If you are using a library which doesn't do this along with your own code, you could be sure to save, set and restore the mode at the beginning and end of your code, so the library won't get a surprise. If you are using interrupts to access SPI for one or more devices, you may need to inhibit interrupts for critical sections of non-interrupt code, and/or be sure the interrupt code saves and restores SPI interface state. The problem is using libraries which assume they have exclusive access to the SPI and do not safeguard themselves or other libraries from surprises. If you have devices which use the same SPI mode and speed and you are not accessing SPI from interrupt code, it's really simple to share SPI among devices, not much to do. I haven't checked the modes of the WizNet and nRF, but they can probably use the same speed. And if the modes differ, I haven't checked the libraries to be sure they don't assume the SPI mode is unchanged between interactions. I just wanted to post to say that I implemented the Ethernet Gateway on the iBoard this afternoon and it worked first time. I used your directions for the hardware modifications and the minor changes to the sketch, uploaded it, turned it on and Voila! it eventually found all the sensors and it up and running. Thanks for the guidance. I received the iBoards in the mail the day before yesterday and planned on getting to it sometime in the next few weeks. This afternoon i power cycled my Vera with the Serial Gateway on it to move a power plug that was in the way and when it came back up it couldn't find the Gateway. I tried everything I could think of and then decided to bite the bullet and do the Ethernet GW right then and there. Glad to hear your network is up and running again. @hek Thanks, the iBoard was an absolute snap solution. Just another thank you for the great instructions. Here is a better pic of the tracks to cut http://i.imgur.com/h87eOIy.jpg although i think i went overboard and hacked it a bit to much. The only problem i had was i had to also un-comment out the following line (To enable it) and force the inclusion PIN number to something other than 3. I would have thought not having it would disable the manual inclusion button, but without doing this, every time there was radio traffic the inclusion mode would start ! Now i just need to find a nice case. Yep - looks like you got em! Do let me know if you do find a nice case... i need one too. I'm powering mine from a 5v plantronics 500ma supply... been rock solid for month or so now. I have built a gateway following the instructions above. It works well, and the mod was quite simple. I have had a first cut at printing a custom case to match, unfortunately I had one of the holes in the wrong place. I will correct this over the next few days. When I get it right, I can post the design if people are interested. @jtm312 - That would be great - its time i boxed mine!! @gregl Here is my first attempt at a case for the iBoard. If I get time I will do a re-spin for the smaller radios without aerials. @jtm312 - Nice one! When my mate gets his printer going again - ill be sending him an order!! @ServiceXp yeh, I was thinking about putting LED and inclusion button into it. I will have a bit of a thing about how best to fit it in. ..but i dont have an old mouse case? @soward Nice one. What sort of range you get? Just thinking the wires around the radio antenna. And myself having short range probably partly due to wire mess.. I haven't really tested the range explicitly, and really the case is hopefully somewhat temporary. That said, the unit is in the basement and I have a temp sensor in the attic which works fine, and another sensor on the main floor at the other end of the house which also works fine. I have noticed that my ENC based ethernet gateway seems to lock up periodically (doesn't respond to ping or TCP on port 5003). I thought perhaps this case was overheating it, but now that doesn't seem to be the case. I'll be switching to one of the iBoard whenever it arrives, but had intended on using the ENC for another purpose, but perhaps not now. @ServiceXp Just added a new version of the box with LEDs and include button. I might add a link on www.mysensors.org if that is ok.
Love It!! You ship to the US? @hek sure, if you want. I hope people find the design useful. I know it's a bit off topic but does anyone have a good idea of a general purpose printer? It seems like the 3D forums are full of people that love their own purchase/decision but have little constructive feedback. @jtm312 - What do you use for small projects like this? Do you like it? @tbully I'm using a Flashforge Creator. It's a Chinise clone of the original Makerbot GPL version. I have made a few minor mods to it and upgraded the firmware to the latest Sailfish version. It came mostly assembled, so I was up and running quickly. There are better printers on the market, but you get a lot for your money. Overall I have been happy with the investment, and it has been great to learn with. Adding the line to setup gave me stability. SPI.setClockDivider(SPI_CLOCK_DIV2); //to assist with gateway stability. @gregl Thank you for your guide how to do the hardware changes. I'm more of a software guy, so I would like to try that route. You mentioned the software changes to the RF24 library in the wiki, but where should I change this library? I'm would like to use the EthernetGateway.ino on the iBoard, but I'm missing something and I can't figure out what it is. Just started with MySensors. I hope you can give me some pointers. ges to the RF24 library in the wiki, but where should I change this library? I'm would like to use the EthernetGateway.ino on the iBoard, but I'm missing something and I can't figure out what it is. Just started with MySensors. Hi Firestarter...Welcome! MySensors is very cool and keeps getting better all the time from community ideas/projects... and of course Hek keeps improving and adding great stuff all the time too! Imho, doing the hardware hack is best as its a one off job ( and its easy )and then you can load newer versions without needing to worry about lib changes! I have just received 2 of these devices and will be making the mods posted over the next week or so but I am intrigued. Is the iBoard a valid product or are we trying to do something unintended with the mysensor software? What I mean is this... how can someone manufacture and sell a duino which requires hardware modifications for it's unique selling characteristics to work? if you sell an Ethernet/RF24 (Header) duino shouldnt it work out of the box? Hi. I have tried nneeoos' solution fot SOFTSPI, but the code only compiles if I use DigitalIO library in my main INO file too (I tried MQTTGateway ethernet on Iboard). I have the latest librarys. After uploading I get "check wires". Hello. I too tried @nneeoo 's edits and am getting check wires. As an update....I gave up on the software method and just did the hardware modification. One question: How did you guys do the LED and inclusion buttons? Did you carefully solder right to the Atmega chip or is there a better place to grab the needed pins? What pins did you use for TX/RX/ERR/Inclusion? Hi @tbully - i personally never bothered with leds/inclusion button. My gatway is underneath my staircase near vera and my wifi router, so other than when i make a change, i never see it - so leds wouldnt help me. I would like a nice 3d printed case for it one day...still havent boxed the iboard up! Same here, @gregl . I appreciate your write-ups above. They really helped out. I'd like to find a printer and user @jtm312 's design but would like to know how he got the LEDs and Button wired up. 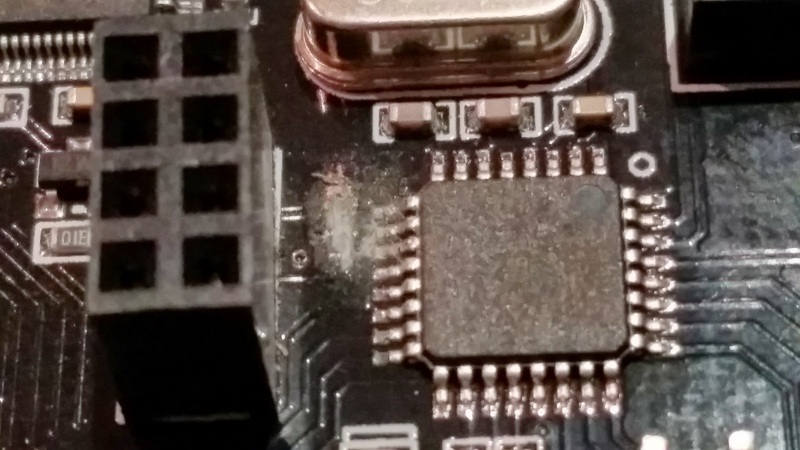 Soldering directly to the chip could be difficult without a steady hand. 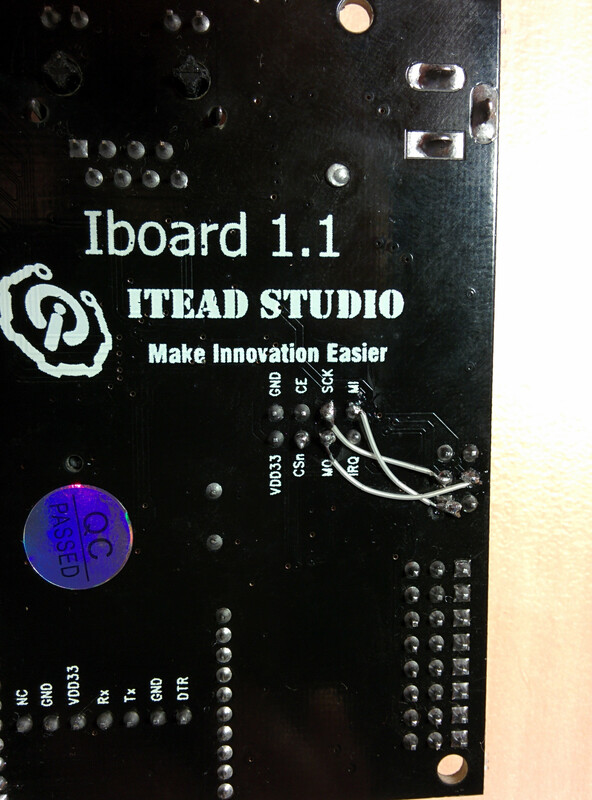 I am using the Itead iBoard as a gateway to a Vera Light for a few days now. Without any hardware modifications, only a few changes in header files required. I think the main issue is that you should map the inclusion button and led's to the Ax pins and use the full constructor (with 7 parameters). Beware of the last line in the first snippet. If you use the shortcut constructor (with three parameters), it will use defaults for the other parameters and your defs will be ignored. To verify my assumptions above, I included a led to the A2 pin and it is blinking as expected on arrival of a packet. The code below may look intimidating. But I posted the whole thing for easy reference. You can do the software changes in one minute. IPAddress myIp (192, 168, 178, 66);  // Configure your static ip-address here    COMPILE ERROR HERE? Use Arduino IDE 1.5.7 or later! // No blink or button functionality. Use the vanilla constructor. @hugob - Finally got to try this last night late...Success! #include <DigitalIO.h>     <-added this too! I also needed to compile it under a newer IDE version due to memory..I used 1.6.5. Good to hear that you can confirm that this is working. My unmodified IBoard gateway is working for months now without problems. But as I said in some other topic, this board needs a decent power supply. So all you need for a MySensors Ethernet gateway is this board, a NRF24L01 Radio that plugs in into this board, and a power supply. No mess with cables like in http://www.mysensors.org/build/ethernet_gateway. This board has 7 IO ports in case you want the leds. For $17.50 this is a no brainer. OK, I did forget some minor drawback. You need a FTDI adapter to program this IBoard from the Arduino UI. My iboard gw is up and running so far so good! Question I see only A0 to A5 I/o s where or how can I use t he sketches pins d6 -d9 pins? I printed the my sensors 3d stl file for the gw and it fits great, but there are the holes for the 3 LEDs and re include button . Any help would be good maybe just a senior moment eh? And test OTA with a sensebender, work fine ! In the original sketch, you map a variable to a Dn pin. E.g. INCLUSION_MODE_PIN is mapped to pin 3. So for the iBoard, the receive LED has to be connected to pin 16 (A2). Etc. If you carefully look at the code, you will notice that also RADIO_SPI_SS_PIN changed from 6 to 8. That is because the header for the radio chip on the iBoard is connected to a different Arduino pin on the iBoard, than it is on the wiring diagram of the original gateway diagram. But this is just an internal issue. It should not bother you if you build the gateway. 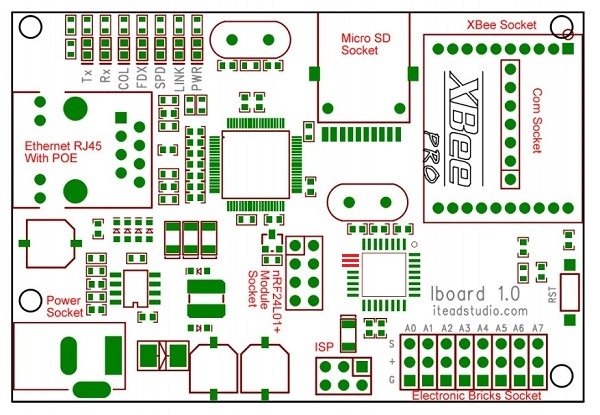 I have got a Wborad Ex board with built in wifi (rak410) from itead. Unfortunately I can not find anywhere arduino code that would work of the board with wifi. Does anyone have the same board and could possibly help? Itead said it works on this demo, but without success . I know this is a basic question but what do I need to buy to program this using USB from my PC? So far I've just tinkered with Nanos which have a usb port on it.... An ebay link would be great! I just changed over to the iBoard Ethernet gateway from serial. I used the FTDI breakout board to program it. Very simple to use. 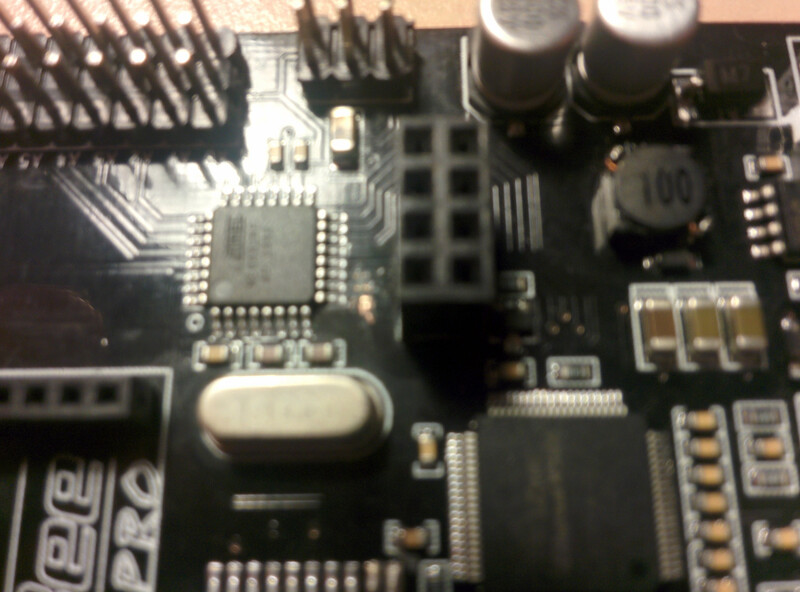 The FTDI board is also needed for programming pro minis. Hello Everyone. Sorry to bother you. I somehow screwed up my iBoard (hardware / trace modification) sketch/config today and was hoping someone could help me think through this. I was having a problem with one of my far away sensors from hearing the gateway so I thought I'd increase power. When I compiled and uploaded the code, I started getting: "0;0;3;0;9;radio init fail"
* > Edit MyConfig.h in (libraries\MySensors\) to enable softspi (remove // before "#define SOFTSPI"). * > Disable DEBUG in Sensor.h before compiling this sketch. Othervise the sketch will probably not fit in program space when downloading. IPAddress myIp (192, 168, 34, 13);  // Configure your static ip-address here    COMPILE ERROR HERE? Use Arduino IDE 1.5.7 or later! // which requires external flash and the DualOptiBoot bootloader. // which might vary, especially in networks with many hops. 5s ought to be enough for anyone. // When enabled, a signing node will salt the signature with it's unique signature and nodeId. // do the corresponding salting in order to verify the signature. // nodes have to implement whitelisting for this to work. // This is also act as base value for sensor nodeId addresses. Change this (or channel) if you have more than one sensor network. #define RFM69_ENCRYPTKEY    "sampleEncryptKey" //exactly the same 16 characters/bytes on all nodes! I vaguely remember getting the 'radio inti fail' error when i first setup my iBoard (with hardware mod) and the only difference i see between my sketch and yours is mapping the inclusion button and led pins to analog pin numbers. Thanks @Dwalt I'm pulling my hair out here. Pin 5 should matter (nor should the others) as it is freed up with the "hardware mod" of @gregl 's engineering. I changed all four settings anyway, just in case. No go. To close the loop on this (and to help future dwellers), a new board solved the issue. Not sure what wasn't working properly on the old board but I'm up and running again (with the same old radio, supply, etc). Also, since I've learned a little and now understand a few of the configs better since my original iBoard build, I was able to do this WITHOUT the hardware mod. I have been trying to get my iBoard working correctly for a few months on and off and finally got it up and running with good range and things are working good. However I am having an issue with the gateway always being stuck in inclusion mode, I have the following sketch, I would like to retain the onboard LED's but I don't have an inclusion button or need one since I can start the inclusion process from Vera. Any guidance would be greatly appreciated. IPAddress myIp (192, 168, 2, 62);  // Configure your static ip-address here    COMPILE ERROR HERE? Use Arduino IDE 1.5.7 or later! this is the second iboard gateway to be set up for me. The first went off without a hitch. It was and is still up and running flawlessly, how ever there is aproblem I have to day. I believe I have used the same program as is indicated in this thread and have done so by the h/w method. When using the arduino 1.6.5 IDE and set to Duemilove board 328 processer and proper USB port, when using the serial moniter the message "0,0,3,0,14 gateway started " is what is shown. However when Iboard is plugged into Ethernet port on modem, there is no interaction on the vera 3 dashboard (ui5) and for the life of me I can not figure out the issue. suggesting there is some communication between iboard and modem. As there is no check wires, all in the board seems well. Any ideas on the problemI? I have tried different rf24 and power supplies or have I forgot to do something with the vera. I had usb gateway but it has been deleted from vera3. Edit When I go to the router and inspect for connected things the Iboard does show up under the proper reserved ip (10.0.0.20) with port 5003. This unit is in remote home and first unit is at residence, both with own vera but both use the same mac dead beef feed. @5546dug It sounds like everything is working correctly with the iBoard itself, did you configure the MySensors plugin for the IP of the GW? When I switched from serial GW to iBoard, I did not delete the plugin, I just entered the IP Addy in the plugin settings and boom, everything worked, and zero hiccups with the GW ever since. @Dwalt I think this where the issue is I cant seem to get the My Sensors plug in to show on the vera3 dashboard. @Dwalt I believe your reply caught my problem, in IP address bar I was missing the semi colons on the DEADBEEFFEED mac, It would appear that the issue has been resolved for now . I just buyed an iboard and following your instruction I tried to get it working in my domoticz configuration, but without success. As at today MySensors library is updated to ver. 2, can you please tell me how to proceed in order to have it working correctly ? I used the sketch available in MySensors Library in my arduino IDE 1.6.13, but I never able to ping it from my computer. As for now I prefere don't go for hardware modification, can you please suggest me what kind of modification I have to do and where I have to do it ? Because I don't know if I have to modify only the sketch or if I have to modify the file MyConfig.h or what other file I have to modify. Thank you very much for your help, now I succesfully connected my iboard card as LAN Gateway without doing any HW modification and even any software modification to any library, simply using the sketch you sent here. 2016-12-18 12:06:45.841 MySensors: Connection reset! Consider to use the Arduino IDE 1.6.8 to compile and upload the sketch, otherwise, with newest Arduino IDE you will get the error messages above. Thank you again for you help and a big hello to all the members of the forum.